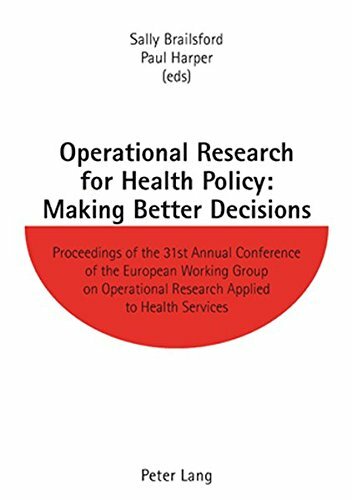 ORAHS, the Working Group on Operational Research Applied to Health Services, is a special-interest group of EURO (the European Association of OR Societies). ORAHS meets every year in a different host country. The objectives of the group include communication of ideas, knowledge and experience concerning the application of Operational Research approaches and methods to problems in the health services area; mutual support between members; and collaboration on joint projects. The 31st meeting of ORAHS was held in 2005 at the University of Southampton, UK. A total of forty-one scientific papers were presented, nineteen of which are contained in this volume. The application areas covered include resource allocation, performance measurement and disease modelling, from within Europe and beyond. The approaches used range from mathematical optimization, simulation and statistical modelling through to «soft» OR. These proceedings provide a broad perspective on current research in this area across Europe and beyond. The Editors: Sally Brailsford is a Senior Lecturer in Management Science in the School of Management, University of Southampton. Her research interests include simulation modelling methodologies, system dynamics, health service research and disease modelling, and the modelling of human behaviour in healthcare systems.<br /> Paul Harper is a Senior Lecturer in Operational Research within the School of Mathematics, University of Southampton. His research interests are in simulation, healthcare modelling, OR for developing countries and data mining.